It was conceived by architectural consultants Broadway Malyan, who were required to design a building which adhered to very stringent environmental and energy-saving criteria specified by the client. Using state-of-the-art materials and innovative technical solutions, they have created a structure that is environmentally friendly and energy efficient. The specification issued by the client included requirements for high levels of transparency and solar control to the east and west elevations. 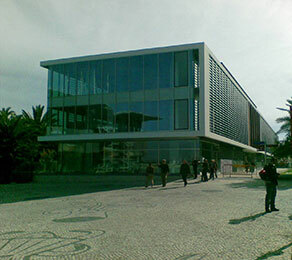 In accordance with this, the building features tinted/fritted glass louvres along the length of the structure. Visually, Cais Office suggests a glass box encased in a white concrete frame supported by a black stone base. The building features three floors above street level and a two-storey underground car park with space for 118 vehicles. In order to create the long, uninterrupted spans of open office space required by the client, CCL slabs were used and provided the ideal solution by removing the need for any interior concrete walls, pillars or beams. The completed floors had a maximum depth of 30 cm. These were achieved using an unbonded system incorporating XU15 anchors with 15.2 mm strand.